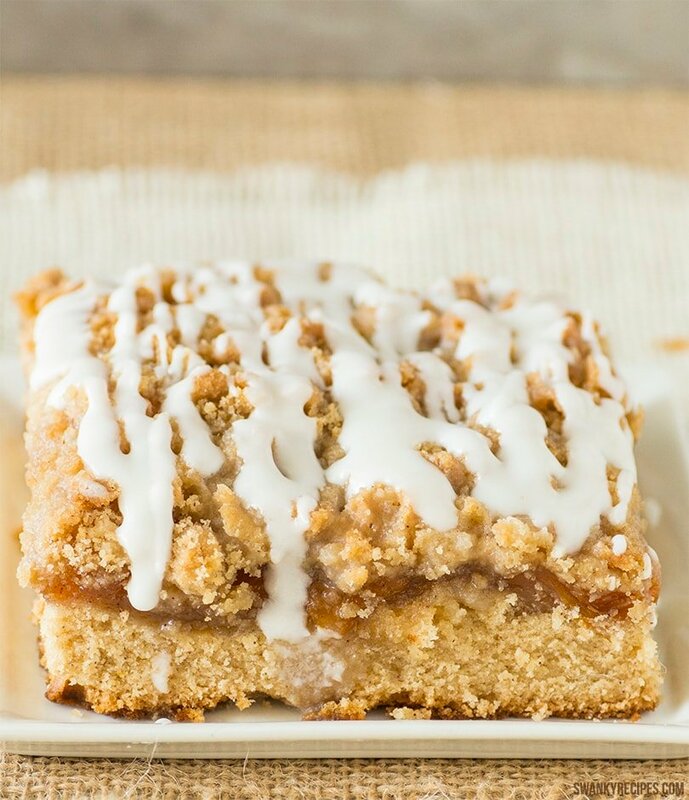 A perfectly spiced peachy coffee cake with homemade peach pie filling, crumble topping and drizzled with icing. 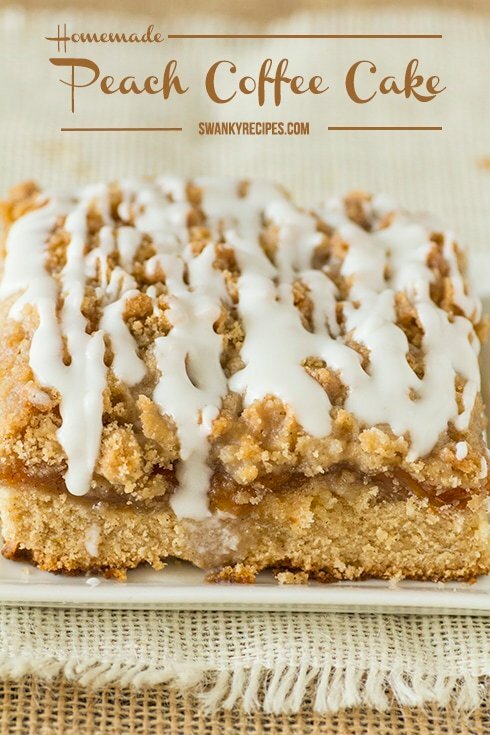 This Homemade Peach Coffee Cake tastes amazingly delicious served right out of the oven. It’s also a great way to use up any peaches you having growing outside or from the grocery store. Peaches are one of my favorite fruits that I cannot seem to get enough of so baking with them makes for the best desserts. Sweet, juicy summer peaches made into homemade peach pie filling never tasted so good! I swear, if no one was watching, I’d just eat the peach filling right out of the saucepan. Now, top it with a scoop or two of vanilla ice cream and it’s dessert! 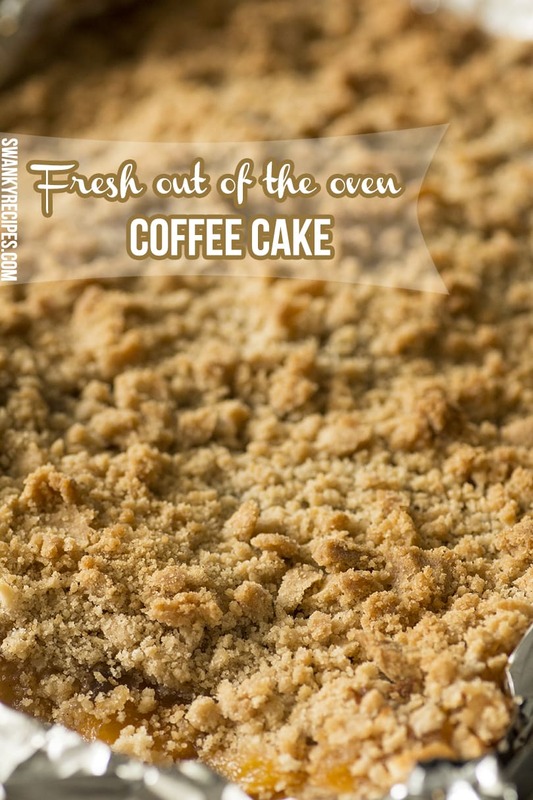 But, before we do that, let’s get back to this coffee cake. If you have never made peach pie filling before, you’re missing out on the good stuff. Let’s talk pie filling for a minute. Dice a few peaches up, toss in a saucepan with water, sugar, cinnamon, vanilla extract and cornstarch. Simply heat it up and take in the yummy cinnamon aroma coming from your kitchen. Seriously guys, peach pie filling, it’s easy, it’s delicious and it’s best homemade with a pinch of love! If you don’t have time to make the pie filling, you most certainly can use canned peach pie filling from the grocery store. Bake this deliciously spiced Peach Coffee Cake and enjoy it for breakfast or dessert. Sweet peaches make for a great fruit pie filling that can be used in pies, cakes and cobblers. Homemade Peach Coffee Cake doesn’t take much to bake this sweet breakfast bread. This Homemade Peach Coffee Cake is no ordinary cake, it’s spiced to perfection with cinnamon and nutmeg and packed with lush, vanilla peach pie filling. This decadent breakfast cake starts with a moist layer of cinnamon spiced cake and is topped with a homemade vanilla peach pie filling with a crumbled streusel topping and generously drizzled icing. I can’t think of a better way to start breakfast over the weekend. Oh, and the homemade peach pie filling is pretty delicious too, especially with a scoop of ice cream. This decadent breakfast cake starts with a moist layer of cinnamon spiced cake and is topped with a homemade vanilla peach pie filling with a crumbled streusel topping and generously drizzled icing. [/b]If you are using pre-made, canned peach pie filling, skip this step and go to making the cake. In a large saucepan, combine water, juice, sugar, and cornstarch. Stir over medium heat until thickened and bubbly. Once it bubbles, cook for another 2 minutes, constantly stirring. Remove from heat and stir in vanilla then the peaches. Cool to room temperature then use right away or store in the refrigerator for 1-3 days. Mix flour, sugar, cinnamon, nutmeg and butter (will be crumbly). Take out one cup of this and save for topping. Mix egg yolks with cream and add to remainder of flour mixture. Add salt and baking powder and mix until very smooth. Pour into greased 9X13 pan or springform pan. Put pie filling evenly over top of batter. Sprinkle with crumb mixture. 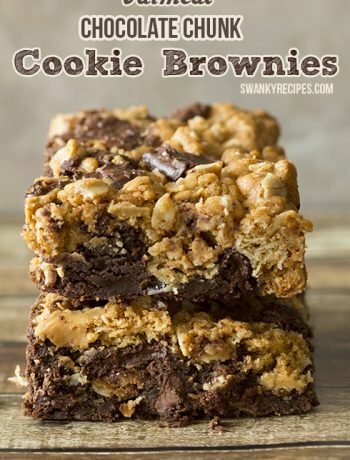 Bake for 55-65 minutes. Until lightly brown on top. Allow to cool for 10 then drizzle with vanilla icing. 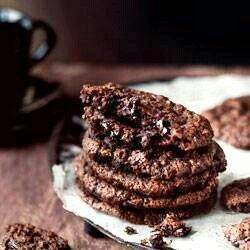 [/b]Combine 1 1/2 tablespoons water and 1/3 cup powdered sugar at time, whisking in between each addition of powered sugar. 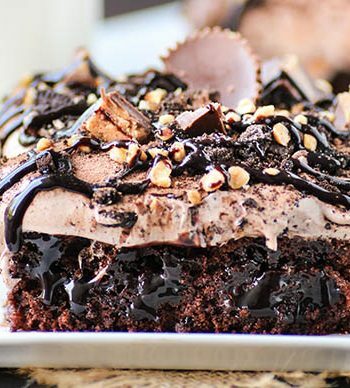 Drizzle over entire cake. Add 3 tablespoons of cream (or milk) stir until creamy and smooth. Add more cream 1 tablespoon at a time until right consistency (runny enough to drizzle over cake). Wow, this cake looks stunning. The perfect mix of flavors and great balance between batter and filling. Love it! I just made this . Delicious! Glad you liked it, thanks, Shirley! The recipe says fold in the egg whites but never mentions whipping the egg whites, do you just fold in two un-whipped egg whites or is there an omission in the recipe steps? Hi Laura, go ahead and gently whip them just a little and then fold them in.